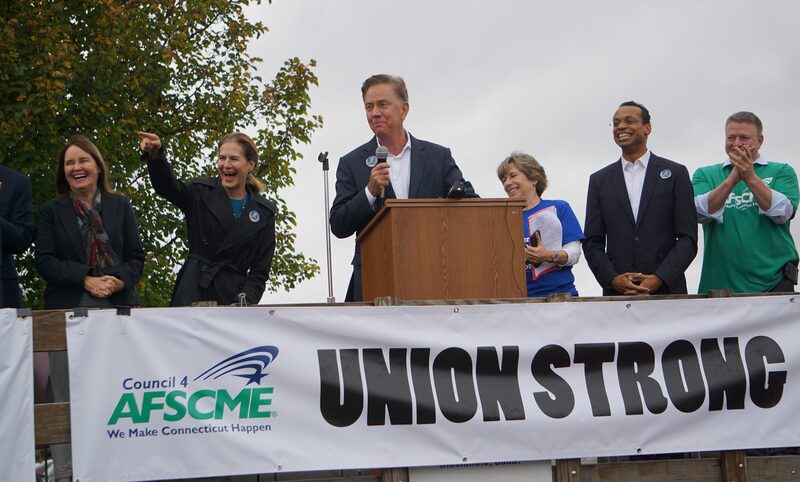 Ned Lamont addresses a campaign union rally. Nearly three months in office, Gov. Ned Lamont has promised an open door and open mind to both business and labor, while siding firmly with the rich on taxes and the working poor on the minimum wage. All in all, Lamont has left his friends in progressive politics to wonder at times what values lay at his core. Lamont ran for governor last year as a defender of collective bargaining by public-sector unions and pledged his support for a $15 minimum wage and paid family and medical leave. He also touted his background as a cable entrepreneur, someone committed to fiscal discipline and economic growth. But his proposed budget has been a disappointment to liberals, expanding the goods and services covered by the sales tax, while holding the line on the income tax — a pledge he made during the campaign. His nomination of David Lehman, a partner at Goldman Sachs during the 2008 financial collapse, as commissioner of economic development has also struck some allies as tone deaf. It has forced the administration into an awkward lobbying campaign for his confirmation. The Senate could vote on the confirmation today. And, finally, Lamont has asked labor for concessions on retirement benefits, angering his union supporters. Ryan Drajewicz, the governor’s chief of staff, said some tensions with labor are inevitable as the administration closes a projected $3.7 billion budget shortfall over two years. The governor is now meeting every other week with labor, he said. Gov. Ned Lamont and David Lehman. Lamont is the great-grandson of Thomas W. Lamont, who represented the U.S. at the Versailles Conference in 1919, and was an informal adviser to Woodrow Wilson, Herbert Hoover and Franklin D. Roosevelt as a partner and eventual chairman of J.P. Morgan & Co. Some of his liberal supporters say FDR could be a model for the great-grandson. The right thing to progressives like Swan, the executive director of the Connecticut Citizen Action Group, is to raise the top rate on the income tax. Connecticut had the highest per-capita income in the U.S. in 2018, as well as one of the greatest gaps in wealth and poverty. Lamont has reneged on one campaign pledge by proposing highway tolls for all motor vehicles, not just trucks. 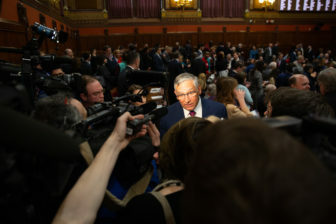 But he told the Connecticut Business and Industry Association last week that he was not budging on his promise to hold the line on the income tax. “I have to give people some certainty that my word is good,” Lamont said. Joseph Brennan, the president of CBIA, said he sees Lamont is “absolutely sincere” in his desire to stabilize the state’s finances and grow the economy. “I think his head and his heart are certainly in the right places, but he’s got to deal with the legislature, which has a pretty aggressive agenda” of things that run counter to a better business climate, he said. Brennan said business appreciates that Lamont, in trying to broaden the sales tax base, did not propose applying the sales tax to business-to-business transactions. Senate Minority Leader Len Fasano, R-North Haven, said he finds Lamont to be personally engaging, but he and other legislators are uncertain about the governor’s core beliefs, which can complicate Lamont’s job when it comes time to negotiate a budget deal or final version of legislation. 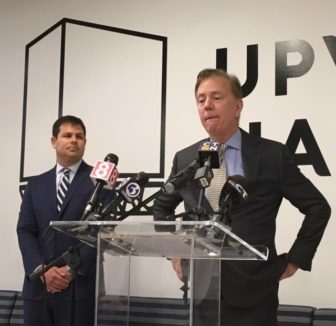 Colleen Flanagan Johnson, the governor’s senior adviser, said that Lamont’s repeated promise that he is willing to listen to anyone who has a better idea is a sign of confidence, not weakness. Last week, Lamont was firm before a business audience in reiterating his commitment to a $15 minimum wage and a paid family and medical leave law, a message the audience did not want to hear. To labor, Lamont is insisting on a four-year timetable to raise the current $10.10 minimum to $15, not the three-year schedule sought by the political left. Rep. Toni Walker, D-New Haven, the co-chair of the Appropriations Committee, said she appreciated that Lamont was willing to defend those pro-labor positions to a business audience. But she is among the liberals who would like to see a more progressive approach to budget and tax issues. “The jury’s still out with me about which direction the governor is going. I really do think he’s doing a best faith effort,” she said. House Speaker Joe Aresimowicz, D-Berlin, said he can empathize with Lamont being pulled in opposite directions by labor and business.